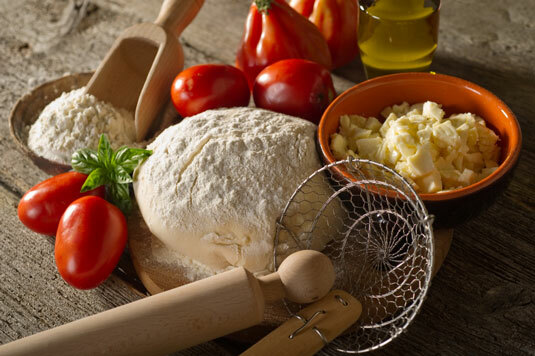 You can make pizza dough by hand or with the help of a large food processor or standing mixer. To use a food processor, combine the yeast, water, and oil until smooth; add the flour and salt; and process until the dough comes together in a ball. In a standing mixer, the process is the same as outlined in this recipe, except that the paddle attachment does the mixing and the dough hook does the kneading. In a large mixing bowl, combine the yeast and water. Wait 2 to 3 minutes for the yeast to rise and then add 1⁄2 cup flour and sugar. Mix well. Add the olive oil, salt, and remaining 3-1⁄4 cups flour. With your hands or a large wooden spoon, work the ingredients together. Transfer the dough to a smooth flour-dusted surface and knead it until the dough is smooth, about 5 minutes. If the dough becomes sticky when kneading, gradually add up to another 1⁄4 cup flour. Place in a large bowl that’s been lightly greased with olive oil. Cover tightly with plastic wrap and allow the dough to double in size, about 1 hour. Divide the dough into 2 pieces (or 4 pieces if making individual pizzas) and roll them into balls. Rest the dough for 15 minutes before using for pizza or calzone. You have the dough, so now you can turn it into pizza. The process consists of four steps: rolling the dough, transferring the dough to a pizza pan or baking sheet, topping the dough, and baking the pizza. Place the ball of dough on a floured counter or work surface and flatten it with your hands. Keep stretching and pressing down on the dough until it reaches the desired size. You can use a rolling pin if you like, but this tool isn’t essential. Slide your hands underneath the dough and lift it onto an oiled pizza pan. For large 12-inch pizzas, we recommend using a perforated pizza pan that allows heat to attack the bottom of the crust, ensuring that it becomes crisp in the oven. Cook individual pizzas (about 8 inches each) on flat baking sheets. Place your toppings on the dough. Toppings on traditional Italian pies are generally light. Italians are aghast at American pizzas with a pound of meat and cheese. After the dough has been topped, put it in the oven immediately; bake until the cheese turns golden brown in spots and the edge of the crust looks golden brown. If you have any doubts, carefully lift up the crust with a metal spatula (plastic can melt) to see whether the bottom of the crust is lightly browned. You can put two pizza pans or two baking sheets in the oven atthe same time, but you may need to reverse their positions in the oven halfway through the baking time to ensure even cooking. After the pizza comes out of the oven, wait a minute or two to allow the bubbling cheese to solidify again. Then use a pizza wheel to cut the pie into wedges and serve.